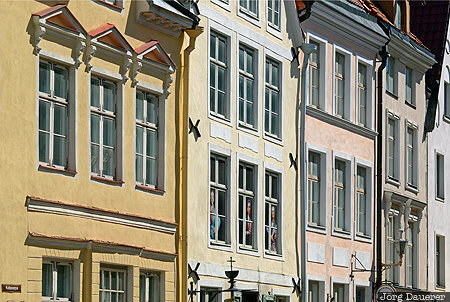 The facades at Raekoja plats (Town Hall Square) in downtown Tallinn illuminated by warm afternoon light. Tallinn (formerly called Reval) is the capital of the Baltic state Estonia. This photo was taken in the afternoon of a sunny day in June of 2014. This photo was taken with a digital camera.